Dr. Aaron Holtebeck is a comprehensive ophthalmologist focusing on cataract surgery, including premium lens implants and LASIK/laser vision correction. His practice also includes diabetic retinopathy, macular degeneration treatment, medical and surgical treatment of glaucoma, as well as the surgical treatment of various eye lid issues. 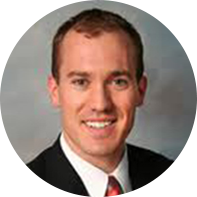 Dr. Holtebeck is a native of Wisconsin, born and raised in Appleton. He graduated from Luther College in Decorah, Iowa majoring in chemistry and biology. He received his Medical Degree from the Medical College of Wisconsin and did his internship at St. Joseph’s Regional Medical Center. Dr. Holtebeck completed his residency training in Ophthalmology and eye surgery at the University of Minnesota in Minneapolis. He is board certified by the American Board of Ophthalmology. Dr. Holtebeck is a past-President of the Wisconsin Academy of Ophthalmology and has been selected by his peers to participate in the Leadership Development Program sponsored by the American Academy of Ophthalmology. He is honored to have been selected to teach cataract surgery and techniques to Ophthalmology residents at the Midwest Cataract Symposium hosted by University of Wisconsin, Madison. Dr. Holtebeck serves as the team ophthalmologist for the Milwaukee Bucks and is a fan of all Wisconsin sports. He is an avid bicyclist and enjoys cross-country skiing during Wisconsin winters. He has participated in the American Birkebeiner Cross Country Ski Marathon and has plans to ski the Norwegian Birkebeiner Race in the near future. Dr. Holtebeck welcomes patients of all ages in the Waukesha, Milwaukee and Oconomowoc offices of Medical Eye Associates.